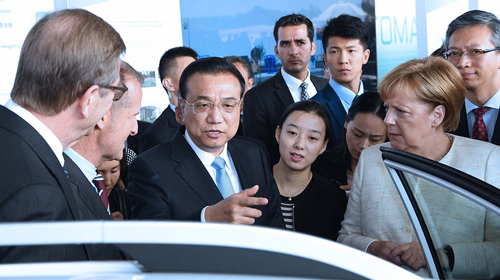 July 10 (Xinhua) -- Visiting Chinese Premier Li Keqiang on Tuesday hailed China-Germany cooperation on autopilot and pledged more support in this field. Joined by German Chancellor Angela Merkel, Li attended an autopilot cooperation exhibition between the two countries. He viewed three autopilot test vehicles produced by six enterprises and technological institutes from China and Germany. Li was briefed on the progress of cooperation, the shares of enterprises from both countries and technological details. The premier encouraged both sides to be more open to cooperation. German enterprises are expected to adjust their technologies and research to the Chinese market, Li said. Li and Merkel also sat in an autopilot vehicle produced by both sides. After a trip of smooth driving, Li invited Merkel to China next time to experience autopilot vehicles. The two leaders also exchanged views on how autopilot can give priority to the protection of the interests of vulnerable groups in traffic, as well as the legal issues concerning the technology, and how the development of autopilot and of smart cities can help each other forward. They also talked about government support and regulations for enterprises. Forty years ago, German companies showed their courage and wisdom to cooperate with China in automobile joint venture, Li said, noting that the German side got rich returns from the Chinese market. In the new round of scientific and technological revolution, autopilot represents the commanding point of the automobile industry and technology, Li said. China is pursuing a new round of opening up and will further relax market access to the automobile sector, Li said. He welcomes German companies to continue to expand investment in China, cooperate more in high-tech fields and jointly seize the opportunities in market competition in the future. Li expressed his hope that the autopilot cooperation will become a new engine for pragmatic cooperation between China and Germany, and inject new impetus to the relationship between the two countries. Li and Merkel on Monday jointly witnessed the signing of autopilot cooperation documents. In a joint statement released after the fifth round of intergovernmental consultations, China and Germany agreed that cooperation in scientific research and innovation is an important pillar of bilateral cooperation, and both sides welcome their scientists to cooperate more in cutting-edge and basic research fields. An open trade and investment environment is important for economic and technological cooperation, Li said on Monday at an innovation-themed forum, which was also attended by Merkel. They reaffirmed their joint efforts to safeguard free trade, resolutely oppose all forms of protectionism, and maintain a rules-based multilateral trading system. During his talks with Merkel on Monday, Li urged the two sides to grasp the opportunities of cooperation in intelligent manufacturing, autopilot, and new energy-driven vehicles. China will continue to step up its efforts to protect intellectual property rights, encourage voluntary technological exchanges among enterprises, and will not allow forced technology transfers, Li said. The premier added that he hopes the German side will treat Chinese investment in a fair and just manner, increase high-tech exports to China, and expand market access for Chinese enterprises. Prior to his official visit to Germany, Li wrote a signed article for mainstream German newspaper, calling for stronger innovation cooperation between the two countries. He pointed out that as China's industries still have a long way to go toward medium- to high-end manufacturing, the industrial and technological complementarity between the two countries will remain strong for a long time to come. In the course of China's industrial transformation and upgrading, Chinese people's way of consumption will change and their demand for high value-added German products will grow further, Li noted. He said that in the new technological revolution, the two countries may fully leverage their respective industrial and technological advantages, and enhance cooperation in such fields as artificial intelligence, new energy vehicles and the Internet of Things. Li stressed that the technological cooperation between China and Germany is by no means a "zero-sum game" where one player gains and the other loses, but a way forward for sharing wisdom and opportunities, accelerating innovation, and promoting common progress.